Defense Minister calls reports of closing of pre-military yeshiva 'incitement' and an attempt to score political points at IDF's expense. Defense Minister Avigdor Liberman opened the weekly Yisrael Beiteinu faction meeting Monday by referring to what he termed a 'plot' which had been published by the Makor Rishon Hebrew newspaper and by Arutz Sheva, according to which the decision to close the Or Etzion pre-military yeshiva was made in order to act against the religious Zionist community in Israel. "The national religious community is a very important community, and I and my party respect this community. 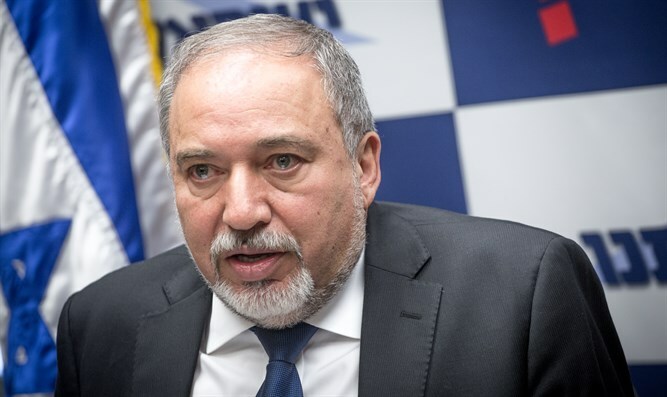 There is no connection between this and the professional decision of the defense establishment," Liberman said. The Defense Minister noted that the decision was made according to data provided by the defense establishment. "The real boarding school in Haifa is a boarding school open to all, and between one-third and one-quarter of the students in the Haifa boarding school wear kippot [and are religious]. And the plots we've been hearing in recent days are a violent attempt to impose a decision on the defense establishment are inappropriate." According to Liberman, the defense establishment gives the religious Zionist community preferential treatment, and noted that the percentage of preparatory programs for the religious Zionist community is disproportionate to their population. He said that there are over 70 hesder yeshivas. "No one else has these kinds of arrangements, where the soldiers serve only 16 months. When I speak of the deferment of military service for a second year, about 80% [of those I speak about] are only for religious preparatory programs, and I do not understand where all of this [criticism] comes from." "This is simply incitement, an attempt to gain political profit, and an attempt to grab electoral advantages at the expense of the army. I call for an end to these plots and incitement. This shows a lack of responsibility," Liberman added. The Defense Minister also clarified that the issue of the closing of the Or Etzion yeshiva would not be reexamined by the defense establishment.